Stoppages Aren't Normal | Robins Plumbing, Inc.
Do you have chronic stoppages? Drain stoppages, though common, are not a normal occurrence. Just like a health professional will tell you that headaches, though common, are not a normal occurrence. If you have stoppages on a frequent basis (more than once a year) it is usually a sign that there is a larger problem at hand. 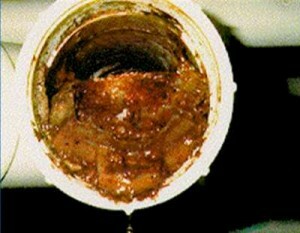 Just like headaches can be an indicator of health issues, stoppages are an indicator of an unhealthy drain system. Settling in our soil can often be the cause as this can bend your sewer line over time creating a belly or pocket in your drain where debris can build up. Roots can also be a culprit as they break through your sewer line and infest your line quite quickly. Multiple stoppages can get very costly, especially if the stoppage creates secondary damage in your home or business. We can help you avoid those stoppages by diagnosing and repairing the underlying condition. A sewer camera inspection will provide a visual inspection of the interior condition of your sewer line and pinpoint the location of the problem. This affordable service will let you know if there is an underlying problem that should be addressed helping to prevent future stoppages and possible damages. Are you a realtor trying to set up a sewer inspection for your client before they buy? We have a special realtor program with savings just for licensed real estate agents. You can get more information and sign up for free here.